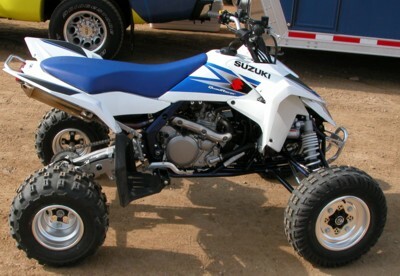 Do to the new 2006 Suzuki Quadracer R450, we had to start another class ATV MX’R Of The Year. 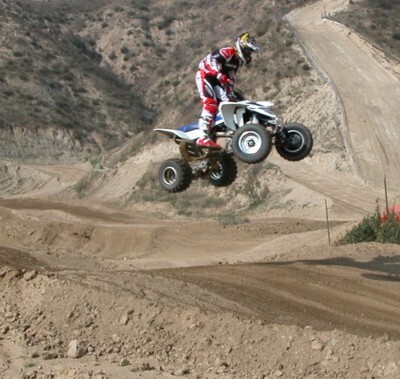 This is for an ATV that can go off the show room floor and go to the racetrack. 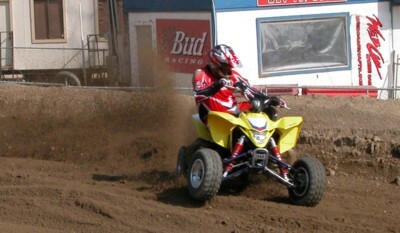 An ATV that is meant for the track and built for the track. Suzuki’s engineering concept of the QuadRacer R450 is “High performance sport ATV with the potential and specifications to win races”. The engineering team has developed this model with the target of achieving performance capable of winning the ATVA Grand National Motocross Championship. Suzuki’s engineering team focused on offering “A powerful engine, superb handling and stability. The QuadRacer R450’s new Fuel-injected engine is based on the RM-Z450 and the chassis is a competition ready with high durability to take the motorcross beatings. The Suzuki R450’s aggressive look comes in white or yellow. You will know this machine is a true racer with it’s mean, low and fat profile. The R450 has a newly designed multi-reflector headlight, which inherits image of Suzuki sport models including the GSX-R. The headlight is mounted on the frame via a detachable bracket by one bolt and is easy to remove when entering races. 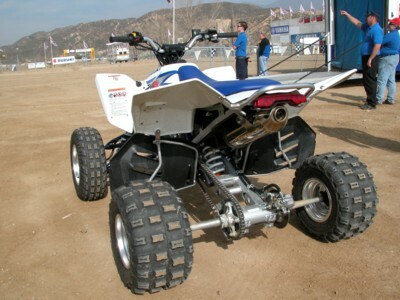 The QuadRacer R450 has a newly designed engine, which is based on the high performance power plant of the RM-Z450. This electric start liquid cooled 450cc 4stroke engine has a single cylinder with a 95.5 bore, 62.8mm stroke and a DOHC 4 Titanium valves. The titanium Intake and exhaust valve stem diameters are 5.0 to 5.5mm for increased durability. The hollow camshafts are designed to be as lightweight as possible, to reduce the moment of inertia. The QuadRacer R450 Has a newly designed 3-ring type piston for higher durability. The cylinder is made of aluminum and the cylinder bore has a nickel phosphorus silicon carbide coating. This allows the cylinder to be as light as possible, tighter piston clearance and transfers heat quicker. On the head the intake valve and exhaust valve are angle at 13 degrees, which makes the combustion chamber compact and increase the compression higher 11.7:1. The QuadRacer R450 has crank balancers on both the left side and right side to reduce vibration. Suzuki also reduced weight buy having the clutch cover, mag cover and cylinder head cover made from Magnesium. There is a 5-speed transmission with close gear ratios. The newly equipped fuel-injection system has a 43mm bore and a multi-hole-type injector for better atomization. Some of the benefits include faster throttle response, optimum air/fuel mixture and reduced fuel consumption. To help the engine breath Suzuki added a stainless steel exhaust system. The R450 has what they call a center muffle, which is mounted, under the seat. By centering it under the muffle it helps with better stability, handling and feel. The overall layout is designed as low as possible. Seat height is the lowest in its class at 780mm. The frame is made of high-tensile steel designed with special attention to rigidity and durability for racing. The Quadracer R450 has a newly designed independent double wishbone front suspension, which provides the longest front wheel travel in its class (254mm). The front shocks are KYB piggybacks with a 40mm piston diameter and a 14mm rod diameter. These shocks adjustments include spring preload, compression dampening and rebound dampening. The rear wheel travel is 277mm and also has a KYB piggyback shock with a 50mm dampener and 18mm rod for better dampening and durability. 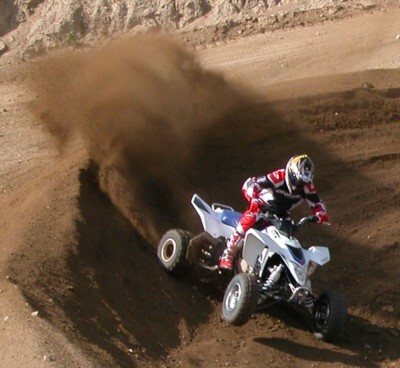 The QuadRacer R450 has a compression dampening adjustability for both high speed and low speed. The swing arm on the QuadRacer R450 is made of steel for durability and is the same one Team Suzuki use’s on the factory race quads. 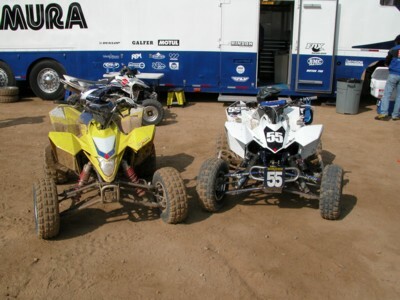 Suzuki also uses the stock axle on their factor racers quads. The rear axle is an extend heavy-duty axle. To put everything on the ground, Suzuki opts for the Dunlop Radial AT20x7R10 tire on the front with a 10.x5.5 alloy rim. On the back they went with the Dunlop AT18x10R8 tires and an 8x8 rim. The tire diameters are the same as Doug Gust 05 Z400 racer. The low tires contribute to a lower center of gravity, longer wheel travel, less unsprung weight and superb cornering stability. As you know, a picture is worth a 1000 words. 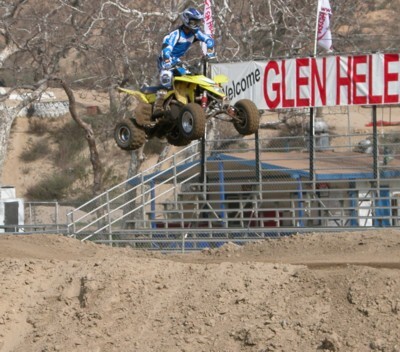 As you can see this QuadRacer R450 was able to soak up the jumps, rip the turns and had plenty of power.